Insulation Guide - Think carefully about the location you want to insulate and decide what your main goal is. Are you trying to seal air leaks, add R-value, or reflect radiant heat? Will the insulation be susceptible to moisture, sunlight, insects or rodents? Is there a specific problem you are trying to solve like condensation, mold, pipe freeze-ups or ice dams? With these factors in mind look for the best insulation type for your situation. 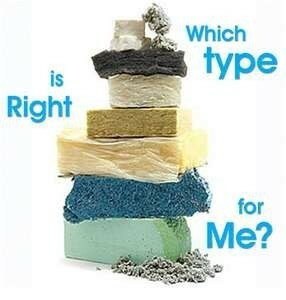 Common Name(s):Fiberglass, fiberglass batts, batts, "the pink stuff"
Weaknesses:radiant barriers are not well understood and little controlled research has been done on their effectiveness, paints in particular are prone to unbelievable claims such as very high R-values- in most cases these are "R-value equivalents," meaning that the radiant heat reflected is "equivalent" to the same amount of heat that would have been lost by conduction. Unfortunately, heat transfer by radiation does not have a direct conversion to transfer by conduction so these R-value equivalents are not accurate comparisons. Insulation-Guide.com regards the claims of radiant barrier paints as dubious and would like to see more 3rd party data that supports the claims. Strengths or Best Use: locations prone to radiant heat loss or gain, moreeffective at reducing AC costs than heating costs, most effective in the attic above existing insulation, installed facing up. It also has the advantage of being easier to ship and taking up less trucking and warehouse space and not as irritating to install as fiberglass. Common Name(s):Flash and batt, flash and dash, thin coat of spray foam for air sealing and remaining cavity filled in with less expensive insulation system.